we all have our prejudices. we all like particular bikes, even if we can't afford them, we either like rouleurs or grimpeurs, some of us like the classics while others dote on the three week tours. and we here at the post are no different than any others. just because all this is on a website, and unlike many of the genuine cycling press, we're not scared to give voice to these prejudices. unless, of course, somebody challenges us, then we usually back down. and that last part is something that rapha have been oft criticised for. one of their breathable stowaway jackets, while being particularly effective and very practical to stuff in a rear pocket, cost just under £200. is that justifiable? that's a question that can only be answered by the individual, but it has always seemed very strange that we will happily part with about £3500 for italian carbon fibre, then have a sharp intake of breath over the price of a garment that is constructed with the same degree of thought and passion. as an example, take the fixed rucksack (right). this was first shown in a rapha catalogue well over a year ago, and it had already been in development for a while before appearing in print. here we are in late april 2007 and the only example that exists currently is the prototype shown here. because rapha are still 'not quite there'. this kind of detail takes time and costs money. simon agreed that it would have been simpler and cheaper to buy in an 'off the shelf' rucksack and attach a rapha logo - we'd have been using it over a year ago. but it wouldn't be rapha, and it's unlikely that it would fulfil their, or our, expectations. as it is, the central strip with the rapha logo is covered in little reflective dots which appear rather glaring under car headlights. 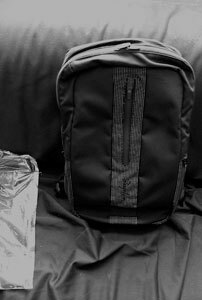 there are two small side pockets that are accessible while the rucksack is in situ, and semi-rigid squares on the back to allow a degree of ventilation while in use. the internal pocket for sunglasses is lined with tricot to avoid scratches and if anything, to clean your glasses when they're inside. the zips are waterproof, there's a pocket which will accommodate up to a 15" laptop, and if it is your want, you could insert a camelback bladder. similarly their new gilet. 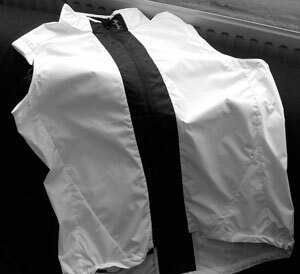 the original rapha gilet had over-the-head fitting with shoulder zips, was made from parachute silk and could almost be stuffed in an envelope. but times have moved on, and rather than rest on a degree of success, the gilet was redesigned and now looks like this (right). to paraphrase a recent article in rapha's rouleur magazine you want people with this degree of passion to be designing your cycle clothing. that they are all passionate about their cycling is evident from the first step through the door of the perren street office. to the left is a cycle rack filled with condor and colnago bicycles, and the whole place just exudes cycling. i have been in offices where there is no way you could tell the services purveyed within. and this passion for cycling goes further than proffering quantities of sportwool jerseys. they also co-sponsor the rapha condor cycle team which has been enjoying a high degree of uk success in recent weeks. and we will soon have the opportunity to purchase some limited edition replica rc jerseys. just to confuse the issue, rapha has two simons: simon mottram, the guy responsible for it all, and simon huntsman who is responsible for the products. the latter was previously designer at rohan clothing. 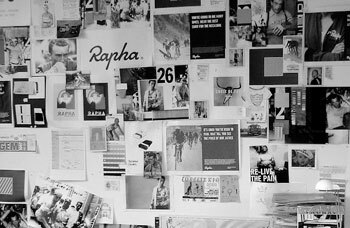 creative director is luke sheybeler, and rouleur editor is the renowned guy andrews. if, like me, your main point of contact with rapha is the plain old telephone system, then rene groot (right) and claire wilson would usually be the cheery voices that greet you. unfortunately, as mentioned elsewhere on the post, claire (their very first employee) has now left to pursue a new career - she will be sadly missed. 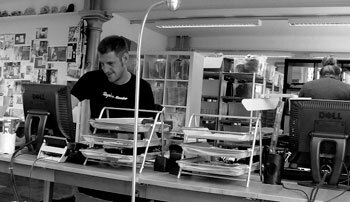 having ordered your rapha items, joe packs them all up into those eagerly awaited shiny black parcels before they become the responsibility of the post office. the only other thing that you really, really need to know about rapha is that, yes, they do have a bright pink sofa.